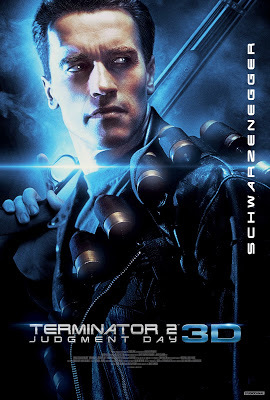 STUDIOCANAL and DMG ENTERTAINMENT are pleased to announce the UK theatrical release date for James Cameron’s TERMINATOR 2: JUDGEMENT DAY 3D as AUGUST 25th 2017. STUDIOCANAL will be releasing in the UK, France, Germany, Australia and New Zealand, and Distrib Films will be releasing in the US. It has been 10 years since the events of Terminator. Sarah Connor’s ordeal is only just beginning as she struggles to protect her son John, the future leader of the human resistance against the machines, from a new Terminator, sent back in time to eliminate John Connor while he’s still a child. Sarah and John don’t have to face this terrifying threat alone however. The human resistance have managed to send them an ally, a warrior from the future ordered to protect John Connor at any cost. James Cameron’s epic action, sci-fi masterpiece starring Schwarzenegger in his most iconic role, has been converted in immersive 3D by Cameron himself. First hitting our screens in 1991 with groundbreaking special effects, the 3D version will take the seminal blockbuster to the next level of effects and into the 21st century for the next generation of fans. The project was initiated by Lightstorm (lei), James Cameron’s production company, DMG Entertainment and STUDIOCANAL. James Cameron's team oversaw this 3D conversion from start to finish. This highly experienced and award-winning team had already supervised Titanic's 3D conversion and is currently working on the Avatar sequels. The original 35mm negative was scanned and then restored in 4k at Deluxe L.A., under the supervision of Geoff Burdick, Lightstorm. The film was calibrated in 4k by Skip, James Cameron’s colorist, at Technicolor Hollywood, with a selection of the best 35mm prints from the film's first release. The film was then converted into 3D by Stereo D (Star Wars, Avengers: Age of Ultron, Jurassic world). This work lasted almost a year and was monitored daily by Lightstorm's teams, to produce a high-end 3D version at the level of the latest 3D releases from U.S. Studios. The 3D version then benefited from a calibration and a specific finish at Technicolor Hollywood, still under the supervision of Skip and James Cameron himself. Cover art for House of X #1 and Powers of X #1 revealed for the first time, beginning a historic new era for the X-Men! Today, Marvel released a special edition of THE PULL LIST, unveiling exclusive information for titles coming to comic shops this July! Presented by hosts Ryan “Agent M” Penagos and Tucker Markus, THE PULL LIST sheds light on some of the most highly-anticipated Marvel comics news, sharing details on writer Jonathan Hickman's new direction for the X-Men; trouble for Rocket in "Guardians of the Galaxy"; The Thing and Hulk clash in "Fantastic Four"; and new series "Punisher Kill Krew #1" and "Loki #1." For more information, check out this special episode of Marvel’s PULL LIST at http://marvel.com/julycomics. Tune in to Marvel’s Pull List each week for more exclusive news and reveals! The successful 'desert island' Steam title leaves Early Access first on PlayStation 4 and Xbox One, complete with new features and content. Leading publisher of digital entertainment Telltale Games, alongside developer Beam Team Games, today announced that open world survival game Stranded Deep will be available for download on PlayStation 4 and Xbox One starting October 9, 2018. Pre-orders are now available for $19.99 USD on PlayStation 4 and will also be available on Xbox One soon. You can download the new trailer by following the links above. Unearth the Secrets of Darth Vader in STAR WARS: VADER – DARK VISIONS! Who is Darth Vader? You’ve known him as a symbol of power, a villainous commander, and a Sith Warrior. But this March, get ready to see a side of Vader you’ve never seen before – and a side that the galaxy has never seen before! Writer Dennis Hopeless (Cloak and Dagger, Jean Grey) invites you to experience all-new twisted adventures of the Dark Lord. With rising star artist Paolo Villanelli (Star Wars: Lando Double or Nothing, Star Wars: Rogue One Adaptation) taking on issue #1 and break-out artist Brian Level (Thanos Legacy, Amazing Spider-Man: Renew Your Vows) joining for issue #2, STAR WARS: VADER – DARK VISIONS takes readers to the darkest parts of the galaxy. Places where even the mysterious anti-hero known as Darth Vader can be someone’s greatest fear, and even…someone’s greatest hope! The limited series begins this spring, in a story that will shed a new light on the many sides of the galaxy’s greatest villain.